Just a word of thanks for your excellent advice and supply of our new staircase recently. All self installed although I did curve to cut and bolt a joist in order to get the post in at the corner due to the fact it was over a wall!! I have attached some images before and after for your use on your site if you wish. Here are pictures as promised . The quality of the oak first class just slight rub down used Osmo oil polyx which enhanced the grain . 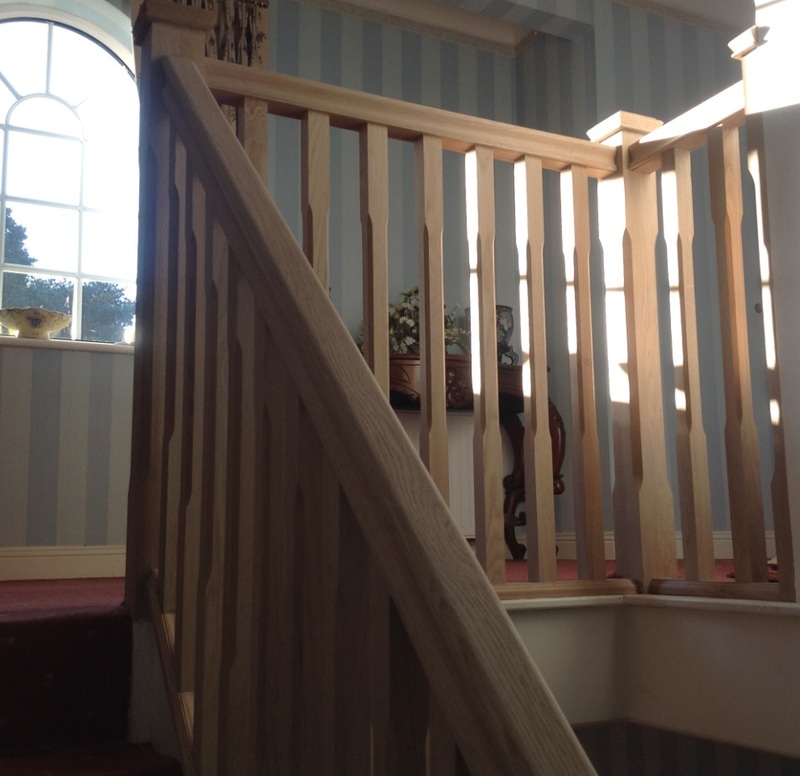 The staircase has now been finished and attached pics show what a lovely job it is with the handrails and fittings. I'm now looking for some Oak Skirting - from your web site I would like Profile 4 - 110mm x 18mm. I know it’s been a while since myself and Angela visited you and purchased our Oak Stair parts but I have finally got to finish our hallway and wanted to wait until the carpets were fitted to send you some photos, before and after showing the transformation.We are both so pleased with the finished effect and the quality and colour of the Oak transforms the hallway completely, we have had many friends comment on how nice it all looks and have passed on your details, I just hope I am not making work for myself !! I cannot remember whether I have sent the attached images to you already - if i haven't then please acceot my apologies for the delay. we ordered the oak stair parts from you. We are absolutely delighted with the result ! I promised I would send you some pics of our stairs, so here you are. The joiner said the product was of excellent quality, he was shocked at what we paid and had no issues whatsoever when it came to fitting them in. We only had to give the wood a light sand and then applied a coat of Satin Osmo Oil which really brought out the grain in the wood. Thanks for your help and advice along the way. Would highly recommend your company to all. Sorry it has been a few months - but finally managed to finish off the staircase project! We are really pleased with it - has made all the difference. Feel free to use in any publicity. I would like to thank you for my order 4107 customer id 4085. The Quality of your products was fantastic, I am a joiner and will be using your services again. 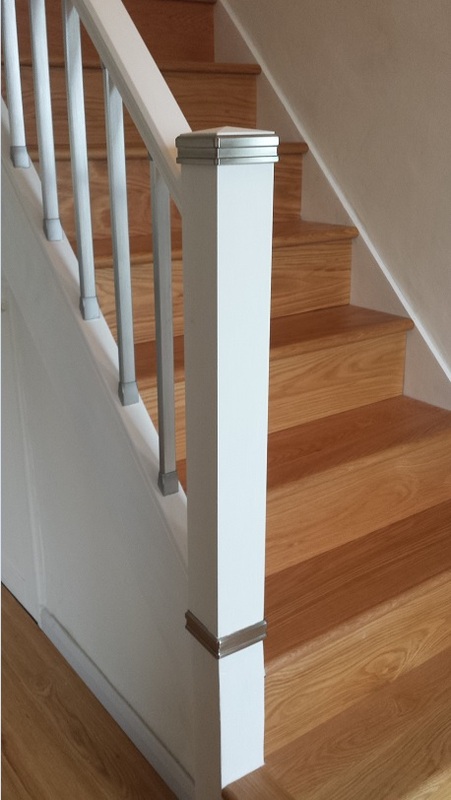 Thank you for the Oak & White Primed Stairparts. My wife and i are thrilled with the quality and your customer service. Impressed with the Quality.We would definitely recommend your Company. We have received our 3 stair newels and acorn caps and are very grateful to you. It is not often that a company actually mean what they say - however, we are THRILLED with your speedy and efficient work ethnic. You were very Helpful, Friendly and Polite on every call which was made and we know that having this delivery today was down to your perfect job skills. The newels and acorn caps are just Perfect so "Thank You Very Much". Wish we had heard of you sooner - it would of saved us so much hassle and time. We now know to recommend this company to others. Thank You Once Again. A Very Very Satisfied Customer. Finished the stairs today.Thanks for all your help and advice. All the parts arrived safely and were of top quality. Many thanks again for your personal and excellent service. Just to say how pleased we are with our recent purchase of stair parts. Also the excellent customer service received. The quality and price of the parts was excellent and my husband is very hard to please being a carpenter. I would say to others do not hesitate in ordering from this business, you will not be disappointed. I would like to offer our feedback about your company and it's products and service and give permission to put it on your web site. My husband and i placed an order for oak stair parts and from placing the order to receiving it we have had the best of service from J and J Stair parts. The product itself is excellent and we are in the process of having the new staircase fitted, already we are delighted with it. I spoke to Janice at J and J several times and she was always very helpful and delivered the best customer service i have encountered for some time. She delivered on promises and never failed to ring me when arranged, she also gave me some excellent advice on the ongoing treatment and maintenance of the product. My husband and i have already placed a second order with this company and again are sure we will get the best product and service available. We would wholeheartedly recommend this business to anyone as we know that this service is given to every customer. Many thanks Janice and J and J Stair parts. I would just like to thank you for the delivery of the stair parts we recently ordered, but also for your service particularly on the phone, i could not fault it,l promises were kept in respect of delivery and call backs, excellent service all round. The stair parts look excellent and it is now being fitted. I do however have a question if you can help. What do we use to finish the white oak wood in terms of protection and ongoing maintenance? My husband didn't realise when he ordered it it could have come pre finished, so we now need to preserve and maintain it. Do you sell the products to do this, or can you advise what we should use. Also how we treat it moving forward. 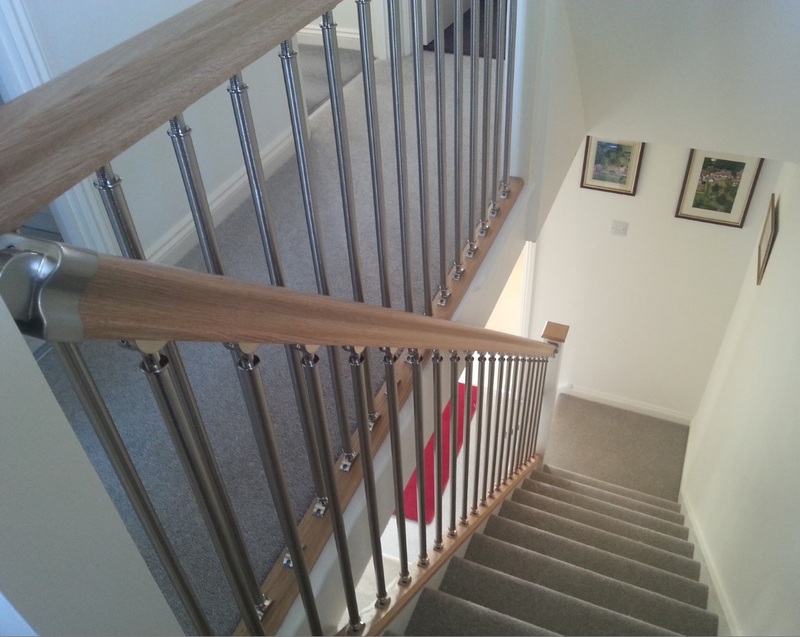 I delayed sending ‘photos of our new stair balustrades until the new carpet had been fitted. That’s done so I have attached some. Everyone who’s seen them so far is very impressed even our builder and his father have said so. Can’t promise more orders yet but we have a daughter and son-in-law who hope to start on alterations to their house soon which will require complete new stairs. Thanks again for all your advice and help we are really pleased with the result. Hi guys,just to let you know our wood arrived at lunch time today,great service and the piece of wood with the grain is great. Thanks again for all your help,hope you have a great Christmas and a happy New year. Thank you so much to all the team at jandjstairparts!!! Merry christmas and new year! Hope these come through O.K. Really pleased with the oak stair parts. Dear Janice Many thanks for your superb customer service the stairs look wonderful! quality is the best he has ever worked with. Once again thank you very much. We were very grateful for your help and advice without which we may not have proceeded. We are are very pleased with the outcome. Very happy to say our install is complete of the stairs and we are very happy with the product purchased from you. through you also after being recommended to you from me and we have since passed on your details to 2 other potential customers too. Thanks again for all your help on our purchase for the house. Would like to give a big thank you to Janice for her excellent customer service. Staircase up and running and looking good. Price excellent, quality excellent and Janice excellent. What more can I say! Thank You – I received the order in good condition and speedy delivery today – thanks and I will be ordering more of the fusion connectors soon. Thank you for a brilliant, friendly and helpful service. Newel post delivered and in place. Received my goods today and was very pleased with the quality for what I paid will recommend to all. 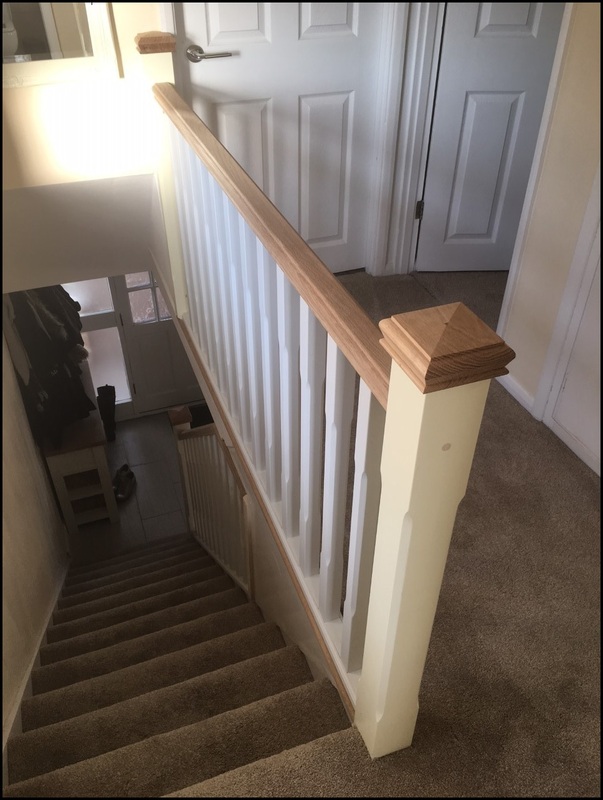 Just wanted to let you know how pleased my wife and I are with both the oak stair parts and the service we received from J & J Stairparts and of course yourself. The installation is now complete and has really enhanced our home. Thank you for doing such a great job with my stair spindles. They are excellent and the tulip wood was a great suggestion. I have been very impressed with the service your company provides and although it's a small order you have called and kept me updated at every stage. I will tell all my friends and builder contacts to speak with you about stair products and your services. Thank you once again and I will send you a picture of the spindles when painted. They (4) will be the first ones people see in the hall. I would just like to thank you for the service I have received from you. I have taken delivery of my stair parts this morning they arrived at 8.45 they look in excellent condition and I am just waiting for a joiner to fit them.